Serve a Warm Spinach Salad Recipe topped with mushrooms, bacon and dressing. 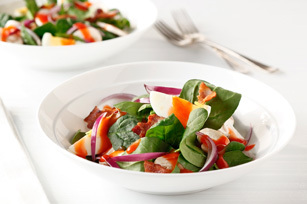 Our Warm Spinach Salad Recipe heats the bacon and dressing in the microwave. Toss spinach with mushrooms in large bowl. Microwave dressing and bacon in microwaveable bowl on HIGH 15 to 30 sec. or until heated through; stir. Add thinly sliced red onions, chopped hard-cooked eggs and croutons to salad before tossing with dressing. Buy pre-sliced mushrooms in the produce section of your grocery store. Use scissors to cut the bacon into pieces. 4 servings, 1-1/4 cups each.